Certainly, every human experiences pain and rejection. If the difficulty is long-term, one can almost be driven mad with grief or anger. We want to know why. Physical and emotional problems are so draining, we become obsessed with "fairness." How do we reconcile our concept of a powerful, loving God with the reality of a child's death? Or greed? Divorce? 9. Hey, God’s Got Rights, Too! Joel Freeman's acceptance and care speaks to the heart of many who search for meaning and purpose. In touch with human suffering and pain, his personal faith is witness to God's mercy and love. Freeman's moving message in the book When Life Isn't Fair is one of profound hope. 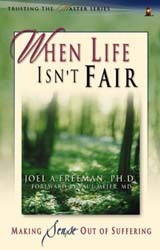 When Life Isn't Fair is one of the best, commentaries to date on the heartaches, trials, and tribulations people experience during life's journey. I saw this book as a means of producing blessing, peace, and assurance to every intellectual level and age group. Why are there fleas? Have you ever asked that question? No? (Obviously you’ve never owned a cat or dog.) Well, just think about it. What purpose do they serve? Granted, their existence creates the jobs necessary in the conception, testing, manufacturing, and marketing of anti-flea shampoos and sprays. But why are they here on this planet? They are dirty and nasty and they reproduce at an incredible rate. Why did God deliberately create such seem­ingly unnecessary pests? Why do they exist? Is there an answer? In the same breath we could ask: Why is there pain? You know, gut-wrenching grief and sorrow? Does it have any meaning? Let’s face it; life presents many challenges to all of us. A child is conceived in ecstasy, but birthed with much pain. The sharpest, hottest tears of a parent, however, are not caused by physical pain. They are the result of a sorrow that is more deeply rooted in the human soul than the body — the pain of a broken heart. And that is the way it is with life. Ideas and dreams are conceived with great enthusiasm, but the implementation of those concepts invites suffering and pain. Some people are bombarded with heartache and trag­edy, while others appear to navigate through life hardly touched by difficulty. Yet everyone endures emotional pain. Suffering is a universal language. I know that language. Like many, I have felt my own emotional pain while crying out, “I never want to hurt this bad again.” I have been through some tough stuff – some of it far too personal to include in a book. On Friday November 16th, 2001 Shirley and I were awakened at 2 AM by the shrill ringing of the telephone. Nighttime phone calls usually mean trouble. And what we heard verified our suspicions. It was horrifying. Our 33-year-old nephew, Michael, had tragically careened off the road and was dead. We both were numb as we made our way in the chilly darkness across the street to the beautiful home he had built for his wife (30) and two children (ages 2 and 4). His wife was sobbing. As the morning progressed, whenever another family member arrived, a new wave of grief filled the living room. The next week was a blur. Visiting the accident site with his father and brother. The funeral. Weeping. Laughing at the memory of Michael’s legendary youthful escapades. And then weeping some more. As time has passed, I have become more aware of the excruciating physical pain Michael experienced for many years, the result of an inherited illness -- ankylosing spondylitis, a severe type of rheumatoid arthritis. Eventually it would have fused his spine together, so that he would not be able to bend over. I had never before realized the full extent of how remarkable a man Michael had been to his family, friends and associates. The perseverance and poise he displayed was in spite of the continual “private hell” he experienced in his knees, back and hips. The shooting pain tested the outer limits of his endurance. By the way, what is your “private hell”? It may be something physical, mental, emotional, financial, relational or spiritual – or a combination of all. For decades I have worked with many people of privilege, including professional athletes, highly-successful businessmen and folks in the music/entertainment industries. I have also worked with many people who experience the dregs of humanity on a daily basis, at street-level. And many who experience life in between. Regardless of one’s station in life, there is a drama of pain behind every pair of eyes. Over the years, I have become more understanding of and patient with people who, like Michael, are overwhelmed by the pain, some even railing out against God in the midst of personal trauma. You see, I too have asked similar questions and made similar statements when placed in the crucible of “unfair” circumstances. When in those situa­tions, I have been amazed by the depths of rage I have been capable of experiencing. The Holocaust in Nazi Germany is a constant reminder of what lurks beneath the surface of people, even those immersed in education, science and religion. What disturbs us the most, though, for the most part is that the perpetrators looked so normal. Emotional pain forces all of us to confront that unpleasant stuff that lies just under the thin veneer of professionalism. Is that the primary task of pain? Maybe. Maybe not. In the future chapters I will relate a limited picture of my own struggles and will share time-tested principles that have sustained me before, during, and after “unfair” events that have left my emotional system raw and bleeding — in a state of shock. The “why” of suffering is the most potent assassin that haunts, taunts, and seeks to destroy the strong and the weak alike. Questions hit us all -- those who are currently in the midst of suffering, those who are trying to assist in some way, and those who are in the people-helping profession, feeling empty and exhausted, needing to be recharged. This book is not filled with glib answers, which serve to drive honest strugglers into deeper disillusionment. In fact, I am rather suspect of those who seem to have all the answers wrapped up in a neat, tidy package: Ten Principles for Happy Sufferers. Instead I want to hand you some tools. It will take longer, cost more and be messier that previously anticipated. But well worth the upward, the inward and the outward journey. I also want you to know that we are in this together. I am learning and growing right along with you. But first, you are about to meet an unusual group of people in a rather unique drama. A place has been reserved for you. Your past, present, and future "unfair" experiences are prime candidates for God’s healing. As you read When Life Isn't Fair, ask Him to help you apply the principles you will be learning. Dr. Freeman's other three books."